The aroma of fresh food emanating from the kitchen is such a delight for the whole family. Naturally, you would want to serve meals that satiate and bring a smile to their faces. Idlis, dosas and vadas, the staple across South Indian homes is fast gaining popularity all across the country. To ease the process of making your favorite food, the Preethi Power Grind WG 907 wet grinder will be your valuable and loyal friend in the kitchen. This wet grinder will make things simple, easy and efficient. With this device, you can enjoy the softest idlis, fluffy vadas and crispy dosas and what’s even better; use this device to knead dough as well. Make chapattis will become much easier. Compact in its design, this wet grinder has a cylindrical grooved natural black stone, a 150-watt high torque motor with 900 RPM and a stainless steel drum, while the overall body is made of shock-proof ABS material. Purchase this device on buy Indian Kitchen to bring home this gem. 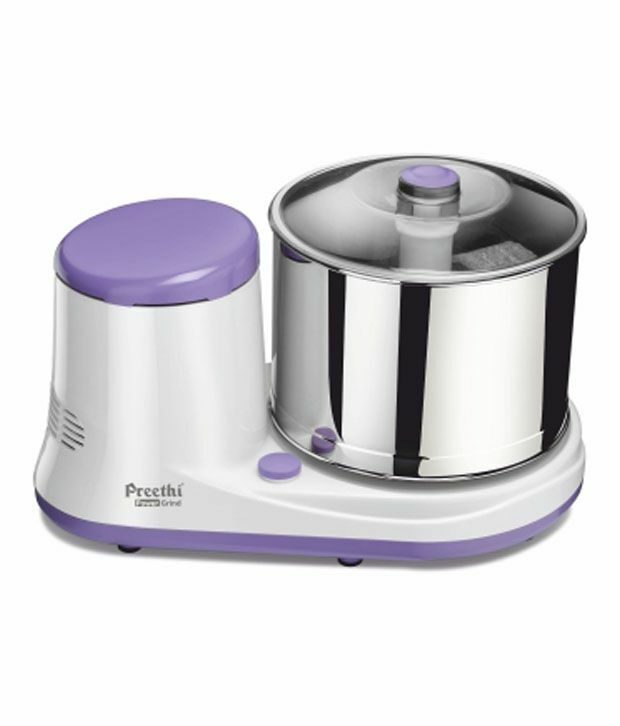 The Preethi Power Grind WG 907 wet grinder comes with a multi-utility drum. Manufactured using food grade stainless steel, the drum of this wet grinder is very efficient and effective. All the goodness of the food that you enjoy eating happens here in this drum. The stainless steel ensures that it does not rust and hence is highly convenient and safe to use. This wet grinder is fitted with the finest quality cylindrically grooved natural stones, which ensure that the grinding is smooth and trouble free. Due to the hard work of these stones, your batter achieves the desired consistency. The Preethi Power Grind WG 907 wet grinder has been constructed using shock-proof ABS plastic. The overall body is made with this material, which makes sure that you are safe from encountering any electrical mishaps. The plastic body also translates into the device being rust-free, durable and long lasting. This Preethi Power Grind WG 907 Wet Grinder has table top functionality and you can place it in any convenient spot in your kitchen. Compact and stylishly designed, this appliance has superior performance because it is fitted with a 150-watt high torque motor with 900 rpm. It also has a PVC insulated flexi-cord with a plug-top this appliance can be used to knead dough to make chapattis with this wet grinder will not only be simple and easy but also an absolute pleasure.